In our article on Starting a New Vegetable Plot, there is a detailed guide to the best ways to transform any site into a fine vegetable garden. Quite a bit of digging is required, so it’s best to start with a small space and do it right. But what if you can’t? I know of three quick ways to create growing space for veggies: bag beds, bale beds, and comforter compost. I’ve tried them all, and each has its pros and cons. Blogger Chris McLaughlin calls bag gardening "the fastest gardening method in town," and it’s true. Position a bag of topsoil or tree and shrub planting mix on the ground, open the top and mix in some plant food, and you have an instant home for a tomato or lovely mix of salad greens. Roots grow through drainage holes punched in the bottoms of bag garden beds, and the bags themselves smother grass and weeds beneath them. Some people like the method so well that they use it year after year. On the down side, some vegetables need more root space than bags provide, and the bags look tacky unless they are very well mulched. And, at the end of the season, when you collect the plastic and dispose of it, the amount of organic matter left to dig into the soil may be disappointingly small. This cool method (shown above and detailed in this article from The Oregonian) involves hollowing out bales of hay, filling them with rich potting soil or compost, and using them as instant raised beds for veggies. 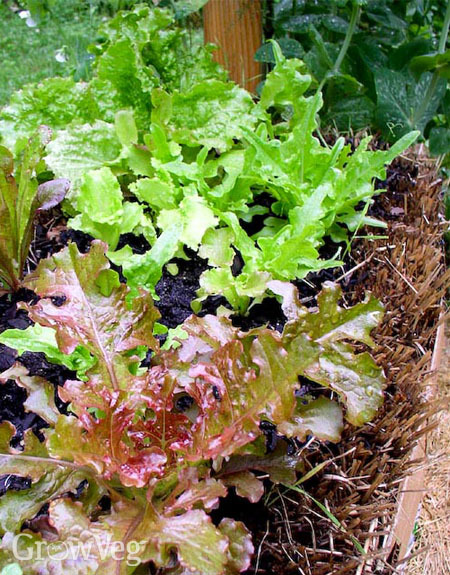 It’s a fun method to try, and it works especially well with shallow-rooted plants like lettuce or Asian greens. The best thing about bale beds is what they do to the soil beneath them. In addition to smothering weeds and grass, the soil under the rotting bales becomes a haven for the earthworms known as night crawlers, which open up and enrich the subsoil with their burrows. After one season beneath a bale, you will have a new bed that’s a joy to dig. There are imperfections. I found that the bales broke down so fast that I needed to add extra helpings of compost every week or two. By midsummer, I had reinforced the outside of the increasingly fragile bales with cardboard held in place with hemp twine. Not very pretty, but the tomatoes I grew in them didn’t complain. In much the same way you might make a lasagna bed (which technically includes specific materials including peat moss), you can go about things more casually by piling compostable materials like leaves, grass clippings and pulled weeds together with thin layers of soil in a low bin (see top picture above). Like layers in a warm comforter, this type of comforter compost heap can do an amazing job as a home for potatoes, tomatoes, squash, and any type of legume. Grass and weeds in the bed’s footprint gradually turn to compost, too. By autumn, comforter compost beds mellow into a deep bed of crumbly organic matter, ready to dig into the soil below. Unfortunately, plants that require firm and fertile soil such as cabbage family crops or corn won’t prosper in a comforter compost bed, and maintaining even moisture levels can be a challenge. Using a soaker hose helps with this problem. These quickie methods are no substitute for deep digging and thoughtful and consistent amending of soil with organic matter, but they are a good place to start. If you know of more ways to quickly expand growing space for veggies, please share them below. "Hello Barbara, I live in Tulsa, OK. and gardening in the city with a small yard can be challenging for growing lots of organic veggies. What I do is collect composting matter from neighbors and I layer this matter all over my yard in fall then in spring I just dig holes just where i am going to plant a veggie or herb. It mixes the composted matter in the soil where the plants are and in between the plant the composted matter keeps the weeds and grass out and the soil moist. It seems to work very well for me. Last year my tomatoe plants were 8' tall and produced very well. No tilling, no weeds, and less watering. " "An idea I've heard of but not tried, which was recommended for making an area where the ground is contaminated productive in a safe way: fill builder's bags with non- contaminated topsoil and compost, and grow plants in the bags. The soil is deep, so good for rootcrops, but I imagine most things would thrive. It might be wise to put a layer of plastic between the ground and the bag, so toxins don't get absorbed into the bag."